Is your boss judging you fairly? Sales strategy professor Steve W. Martin estimates that 70 percent of salespeople are born with natural skills and instincts that make them great at their jobs. While most sales managers would agree with this, it is easy to fall into the trap of using statistics such as these as an excuse to treat your entire sales force the same. Yes, your salespeople more than likely have innate traits that make them great prospectors, cold callers, and relationship builders. But the difference between managing a good sales force and managing a great sales force is in the subtleties. Among your sales force, one person may be especially great at selling in southern regions because that is where he or she worked for years. Another salesperson may be particularly great at building relationships with working mothers. If you forget to treat your salespeople as individuals, you will miss opportunities to align your successful salespeople with the opportunities where they are most likely to succeed. salespeople, you must first know what those differences are. 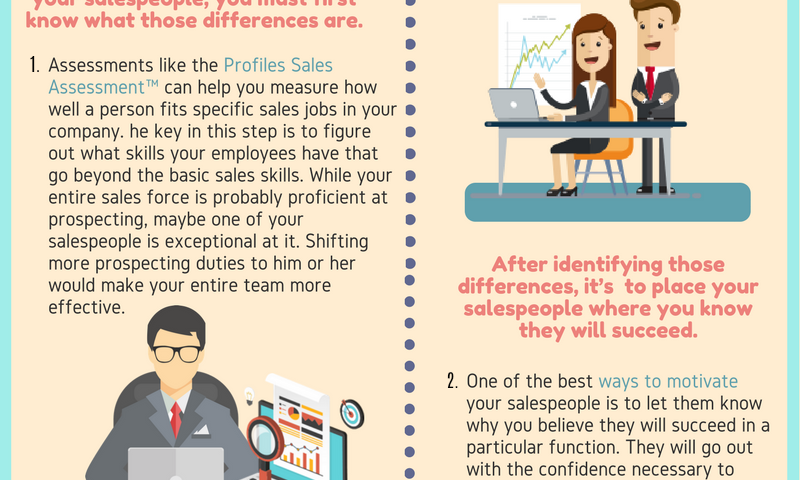 Assessments like the Profiles Sales Assessment™ can help you measure how well a person fits specific sales jobs in your company. You can model jobs based on geography, department, and a host of other factors. The key in this step is to figure out what skills your employees have that go beyond the basic sales skills. While your entire sales force is probably proficient at prospecting, maybe one of your salespeople is exceptional at it. Shifting more prospecting duties to him or her would make your entire team more effective. Perhaps you have a salesperson who makes the majority of his or her sales via phone, without needing face-to-face visits. He or she should take on more cold calling duties. to place your salespeople where you know they will succeed. It is important to keep your sales force in the loop on this step. Do not change your salespeople’s assignments or regions without telling them why. One of the best ways to motivate your salespeople is to let them know why you believe they will succeed in a particular function. They will go out with the confidence necessary to close deals. combination of their basic sales skills and individual strengths to successfully sell. Now that you have identified the strengths of your salespeople and motivated them to use those strengths, it is time to teach them how to use them. This will require knowledge of the sales opportunities you have coming up. Go over each of your salespeople’s assignment lists, pointing out the ways you discovered that their strengths could help them in closing a particular deal. individual skills your salespeople have, do not neglect to develop their basic sales skills. Every job has a set of core skills that you must have to succeed. Sales jobs are no different. Continue to invest in workshops, webinars, and conferences for your sales force. This will allow them to maintain a solid base from which they can continue to build their individual selling styles. Your sales team is not simply a unit; it is a collection of people with different personalities and skills. Recognizing each of their strengths will help you utilize them to achieve success for your organization.